Choose a dog tag from our large range of colours and designs, to suit your dog. Three different sizes available. Free engraving and delivery. 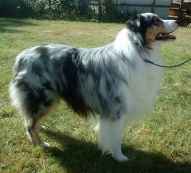 The Australian Shepherd is a herding dog that was developed despite its name in the United States in the 19th century. The dog, commonly known as an Aussie, is popular in its native California and is growing in popularity in countries across the world. These dogs are generally keen, alert and friendly. Despite strong herding and guarding instinct, they have an even disposition and rarely show shy or aggressive behaviour.